Preheat the oven to 400 degrees F. Line a large pan with parchment paper (easier clean up) and set aside. Prep the veggies: dice a red potato (small pieces so it cooks in time), trim green beans, chop broccoli (again small pieces), chop the peppers, mince garlic. 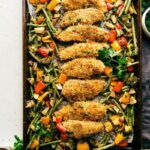 If using chicken breasts, remove excess fat, pound them to even thickness and slice them to the size of tenders (about 1 and 1/4th inch strips) or use chicken tenders. If using tenders, cut off any fat/unwanted pieces. Combine panko, 2/3rds cup freshly grated parmesan cheese, and the remaining half of the seasoning mixture. Mix. In the final bowl, add in the butter and melt. (Just melt -- don't heat it). Coat in flour, dredge in butter, and then heavily coat in the Parmesan panko mixture. Place on prepared sheet pan (OR on a cooling rack -- see note on how to get extra crispy baked chicken). Use any remaining Parmesan panko mixture and sprinkle over and press into the chicken. Bake the sheet pan for 10 minutes and then remove. Using tongs, flip the chicken tenders onto the other side. Stir around/flip the veggies. Return to the oven for another 10-15 minutes or until internal temperature of the chicken is 165 degrees F and veggies are crisp tender. Remove from the oven and toss the veggies with the remaining 1/3 cup parmesan cheese. While the chicken is baking, whip up a sauce to go with it if desired. Mix the mayo, ketchup, garlic powder, Worcestershire sauce, and about 1/2 teaspoon pepper. Whisk. Serve with chicken.